Paleoasis: To eat or not to eat - red meat? To eat or not to eat - red meat? 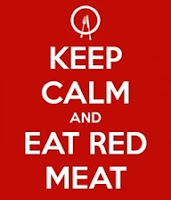 Last March the Meatpocalypse (as Robb Wolf aptly called it) revved up again with the “Red Meat Consumption and Mortality" study from the Harvard School of Public Health, published in the Archives of Internal Medicine. This, of course, led to tons of sensational press, like All red meat is risky, a study finds by the LA Times. What was wrong with the study? Here are some arguments and resources in response. Zoe Harcombe's response to this study is worth checking out as well. Fred Hahn pulled this quote to summarize her criticism, "The raw data actually shows deaths rates falling with increased meat consumption up to the third or fourth quintile – and this is before all the other variables have been allowed for. This would suggest that meat consumption has a protective effect while weight, alcohol, calorie intake, lack of exercise and so on are all taking their toll." Dr. Weil weighed in as well, he says he doesn't think you need meat to be healthy but doesn't think it I bad for you. You can also listen to a discussion of this study on this Latest in Paleo podcast. And Dr. Eenfeldt addresses the difference between meat eaters and non meat eaters in his blog, Do Unhealthy Meat Eaters Live Shorter Lives? And finally, Chris Kresser addresses what the research does and doesn’t tell us about red meat and mortality in his post, Does Red Meat Increase Your Risk of Death? Health, diet, and red meat consumption is a complex issue. If you are happy with your weight, energy levels, sleep, mental and physical health, keep doing what you are doing. If not, perhaps, like me, you might benefit from re-considering your beliefs and conducting a self-experiment. We have to do what feels right for us, as individuals. If meat is not for you, for whatever reason, I highly recommend-for your nutrition, Whole30's Paleo guide for vegetarians and shopping guide. From my experience, my family's health is immensely improved since we started eating red meat last year. It fits my evolutionary perspective as well, as I think of our ancestors who ate meat and all that fat for hundreds of thousands of years, without our modern heart ailments. There are people who only eat eggs and dairy but not meat because they feel it is unethical to take a life. I wish I could say to them, look into how those chickens and cows are treated in order to get those eggs and dairy products, for me that treatment is very far from ethical. (There are local farmers treating their animals well to buy from instead). I recognize and still feel the ethical dilemmas of animal consumption, perhaps as a result of having been raised vegetarian. However, over this last year I have more than come to terms with many of my past beliefs about red meat. We consciously give thanks for the life each animal gave to nourish our bodies. Everyday I learn more about how eating meat can be environmentally sustainable for everyone. We have moved away from CAFO or factory raised meat and animal products in favor of pastured (animals that lived decent lives in pastures) and grass fed products (for both ethical and health reasons). My new viewpoints as a result of this shift can not be explained better than it was in this essay, the winner of the NY Times Contest on the Ethics of Eating Meat. Do I Have to Eat Grass-Fed Meat? "When animals eat right, you do too." "Cancer reports refer to commodity - grain fed meat"
"Grass fed meat contains 400 times more cancer fighting CLA than grain-fed"